Middle and high school students should have some knowledge about the identification of rocks and minerals from elementary school. Early in their school career they likely learned about the basic differences in mineral types using identification properties such as streak, color and hardness to tell the difference in samples. In middle and high school, students can elevate their learning to use more identification properties to tell the difference between minerals that have several properties in common. Tip #1: Give the students real samples to test. Hands-on learning will help the students to understand the information more thoroughly. Some of the tests are will scratch or rub the samples so use samples that are at least one to two inches in size in case the tests destroy a small portion of each sample. Some of the children may be concerned about damaging the samples, but let them know that scientists often must damage or even destroy samples during the testing process. In addition, make sure that the samples are pure or almost pure specimens of the mineral so that the tests are accurate and not confused by the presence of two or more minerals. Tip #2: Supply the students with high quality, proper tools to use in the identification. Black and white streak plates, hand lenses, pennies older than 1982, strong vinegar and metal paper clips are all useful in testing minerals for identification purposes. Mini Me Geology has information in the Dig Into Geology section of our site to help you teach the students how to use the tools, such as streak plates and hand lenses, properly. Tip #3: Use identification information cards, sheets or charts that are easy to read with data about the most important properties of the each mineral. Flow charts are helpful because they give students a specific pattern to follow when performing tests and eliminating minerals as you move from one block to another across the chart. Older children often find information cards or sheets helpful because they can perform the tests in any manner they choose and use the process of elimination to determine the identity of an unknown mineral. All of Mini Me Geology’s samples come with an information card that give the mineral properties such as hardness, luster, and color plus fun information such as common locations and uses of the mineral. The Dig Into Geology section of our website has articles that will help you and your student perform the properties tests such as hardness and streak. You can read these articles here. For students who are very interested in additional information about the minerals they identify, a copy of Simon & Schuster’s Guide to Rocks & Minerals , or a similar book, might be fun for them to review. Tip #4: Middle and high school students are old enough to learn to distinguish between similar minerals. As long as you have high quality samples and the information about the properties of each, allow students to attempt to identify large sample sets. Allow the students to have time to perform all of the tests and determine each of the properties. Have them record each of the properties such as: color, luster, hardness, streak, shape to compare against the information given for each mineral. Other properties that may be helpful are density, saltiness, magnetism, and reaction to acid. 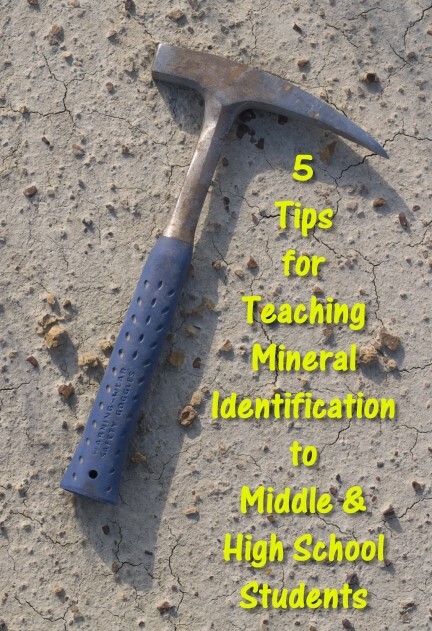 Tip #5: Allow students to work on their own and attempt to identify each mineral sample. Once the students complete the identification process on each sample, walk through each of the samples reviewing the properties. If the students misidentified any of the samples go back through the identification process. Students should understand that some minerals are very similar and even geologists have a hard time telling them apart sometimes. The more you practice the better you become. If you need help choosing mineral samples for your students or explaining the properties of each, you may want to check out our book Help, I Have to Teach Rock and Mineral Identification and I’m Not a Geologist!, which is available on our website. If you have additional questions, please contact us at rockinfo@minimegeology.com and we will help you have a successful mineral lesson.